If what you expect from a handbook is a portable, pocket-sized source of knowledge and instruction, then Casco – Office for Art, Design and Theory’s Grand Domestic Revolution Handbook is not for you. If you are looking for a data-rich, theoretically informed and practically grounded reference book that is encyclopaedic in its approach to its subject, then you’ll find much to appreciate in Binna Choi and Maiko Tanaka’s panoramic overview of Casco’s Grand Domestic Revolution (GDR) research project. GDR was launched on commission from the Utrecht Manifest: Biennial for Social Design, and its most active phases lasted from 2009–2012. These included Apartment 18b, an apartment residency in Utrecht, the GDR exhibition, and GDR GOES ON, an international tour of elements of the project, within which are equally nested myriad practices, reflections and presentations. The Utrecht-based GDR locates its origins in US-based American suffragist and anarchist movements, and the work of architectural historian Dolores Hayden, namely her eponymously titled study of American domestic housing design and organization, its impact on domestic labour, child care and social structures and conflicts. 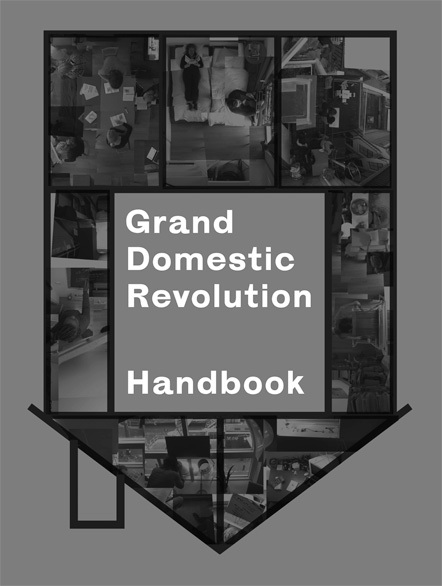 Citing Italian autonomist Silvia Federici, Casco director Choi describes the twenty-first century Grand Domestic Revolution as one which ‘pushes against the capitalist “productivist” force and its perpetuating cycle of over-production, exploitation, and consumption, by collectivizing the everyday work of reproduction.’ This updated GDR considers the home as a site of unrecognized labour (from the plights of domestic workers to those of freelancers working from home), and the economic locus of personal indebtedness and a global financial crisis. Driven by questions around privatization and public dimensions of space, everyday life and culture, this GDR decided to rent an apartment (in a difficult to access housing market) and use it as the headquarters for a long-term experiment in living and working together. Structured according to five themes (Domestic Apparatus, Inhabitation, Work at Home, Economy to Oikos, and Neighboring and Organizing), Grand Domestic Revolution Handbook comprehensively exposes the project’s aims, methods and results by including its early conceptualizations, testimonials from participants, descriptions of interventions by residency inhabitants, photographic and textual documentation of all the phases, theoretical and contextual source texts. An ironically handy ‘user’s manual’ to the GDR, as well as complete bibliography of the GDR library, appear toward the end of the hefty tome. This exhaustive overview is certainly the handbook’s strength, in that it demonstrates a keen historiographical impulse that insures the ongoing relevance of the materials gathered therein. Equally important in this respect is the candor with which Choi reveals, for example in an e-mail dialogue with writer Marina Vishmidt, her own critical perspective on her desire to embark on this domestic research within the framework of an art context. Along with this built-in reflexivity, the editors’ care in crediting all the participants and influences, and for allowing some of the contradictions and failures inherent in trying to live and work together emerge, are noteworthy. Strengths aside, the handbook does not indulge a reader’s weakness (and not only because of its size! ), in that a mind geared toward synthesizing can find it difficult to keep track of all the various voices and practices and strands that have interacted in this collective, and their individual positions or contributions to the research can sometimes be difficult to discern and measure. Casco in Utrecht has become synonymous in my mind with intensive, collective, research-based projects like GDR that scrutinize the potential relationships between artistic practice, community and social change in almost unrelentingly rigorous ways. Casco’s team and supporters seem to depart from a faith, which they constantly test, in the ongoing possibility for social change, as well as a belief that theoretical speculation, collective organization and grassroots action are necessary to inspire and implement change. While I tend to agree, I admittedly observe this from a place of (private) spectatorial remove instead of immersive (collective) participation (due largely to issues of temperament). But it so happens that I was able to experience some of GDR first-hand during a working period when I was partially based in Utrecht; in fact, GDR was my introduction to Casco. Back then I wasn’t at all sure what to make of it. While the smallish-scale city of Utrecht, its resources, inhabitants, neighbourhoods and local cultures operate as the sites, subjects and settings for the ‘living research’ enacted during Casco’s multiple long-term projects (which often overlap), the scope of their reach then seemed quite difficult to measure in quantitative terms, and today I don’t believe that scope can possibly be bound within the covers of a book. Certainly in the little corner of the ‘art world’ I inhabit in art education, the influence of GDR practices of sharing, gathering, cooking, making, reading and reflecting together are not negligible. They have been fully embraced by a young generation of artists deeply concerned with terms GDR has kept in our focus, like reproductive and productive labour, feminist material practices, gender equality (and fluidity) and economic vulnerability. What this second-level of institutional incorporation might mean for such practices as they become increasingly formalized as substitute modes of representation, and legitimized within curatorial projects and contemporary art discourses, should be the subject of another study. Vivian Sky Rehberg received a PhD in art history from Northwestern University in 2000 and an MA in Art History and Criticism from Stony Brook University in 1993. Based in Paris since the mid-1990s, Rehberg worked as a curator, writer, translator and educator in France before she moved to Rotterdam in 2012 where she is course director of the Master of Fine Art programme at Piet Zwart Institute. She is a contributing editor of Frieze magazine and publishes widely on contemporary art.